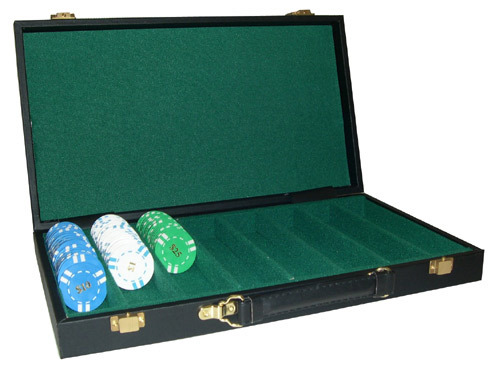 Choose from many styles of poker chip cases with chip capacities ranging from 200 and up! Our silver colored Aluminum Poker Chip Cases have a stylish, modern look. Each case features sturdy stainless steel clasps / hardware. A soft forest green velour style material lines the inside to protect your chips. 200, 300, 500, and 1,000 chip capacity cases are available. 200 Chip Set Sale Price: $8.64. Was $19.50. Save 56%. 300 Chip Set Sale Price: $9.68. Was $25.00. Save 61%. 1,000 Chip Set Sale Price: $39.22. Was $64.50. Save 39%! 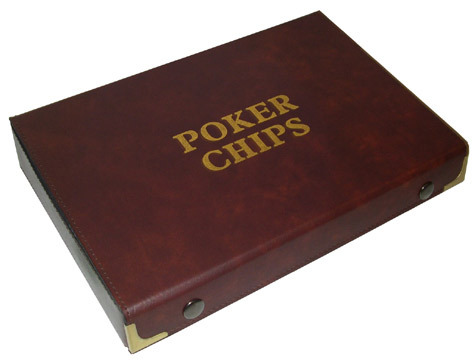 Our Deluxe Leather Poker Chip Case is made of solid hard wood wrapped in 100% genuine tanned leather. Each case features a padded inner lid, two brass colored clasps / locks, double stitched corner seams, and space for two card decks.500 chip capacity cases are available. 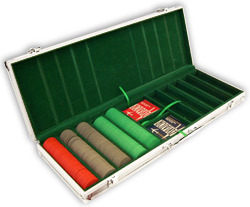 This beautifully crafted, high-quality 250 chip capacity Wooden Poker Chip Case has a classic cherry finish and a forest green velveteen lined interior. 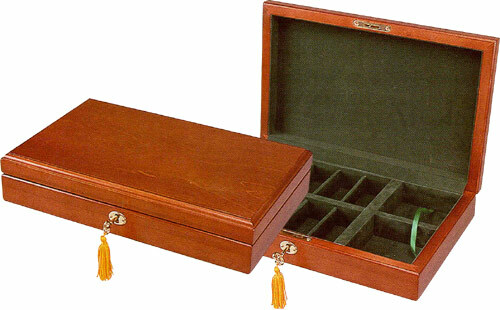 Each poker chip case features solid hard wood construction and a gold-plated lock and key with tassel and hidden piano hinge. 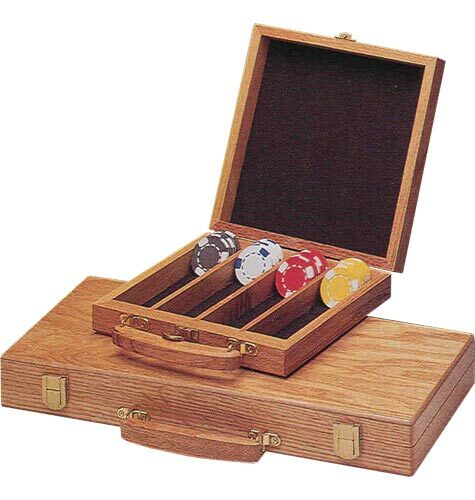 These premium Wood Poker Chip Cases are perfect for a poker player with a taste for excellent quality and styling. This Wooden Poker Chip Case is made of walnut-colored hard wood. 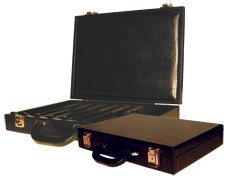 Each case features sturdy brass color clasps / hardware. A soft velour-style material lines the lid to protect your chips. 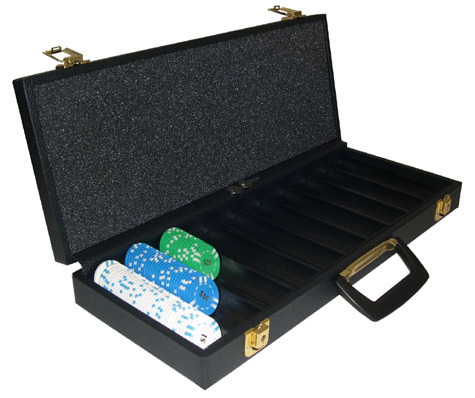 Choose from two chip capacities: 300 / 3 tray poker cases, and 500 / 5 tray poker cases. 300 Case Sale: $30.12. Was $49.00. Save! 500 Case Sale: $41.79. Was $59.50. Save! 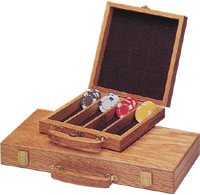 With its Mahogany varnished exterior, our Deluxe Wood Poker Chip Case may be the most beautiful available today. It is a 600-chip capacity case, featuring 12 rows of 50 chips. There is an 8-row removable top tray, with four additional rows under the tray plus storage space for cards and money. 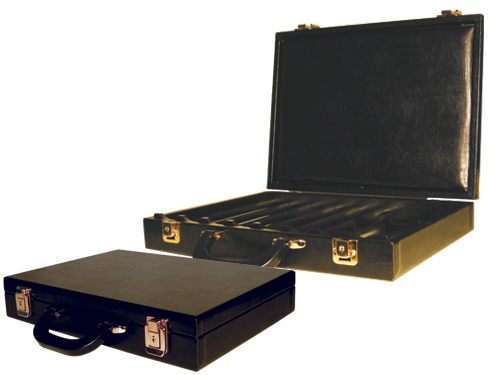 The case also features matching brass carry handles, hardware, lock, and key, and the bottom exterior of the case is covered with black felt to protect your playing surface. Our Heavy Duty Poker Chip Cases are made of the finest materials and are among the sturdiest anywhere. 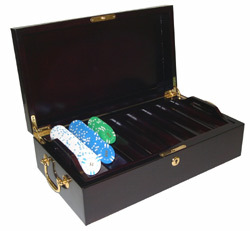 These Casino Chip Cases feature wood construction, black leatherette covering, and a padded inner lid to protect your chips. Our chip cases also feature handsome brass-plated hardware with two locks and keys. The following sizes are available: 300-chip capacity cases and 500-chip capacity cases. 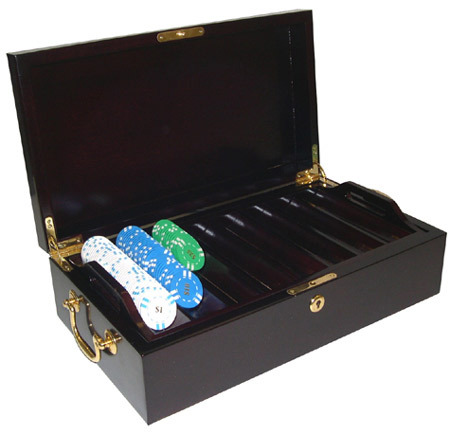 These Imported Vinyl Poker Chip Cases are attractive, sturdy, and priced to sell! Choose from 300-chip capacity cases (available with space for two decks of cards), 400-chip capacity cases, and 500-chip capacity cases. 300 Chip Set Sale Price: $15.60. Was $19.50. Save 20%! 400 Chip Set Sale Price: $18.00. Was $22.50. Save 20%! 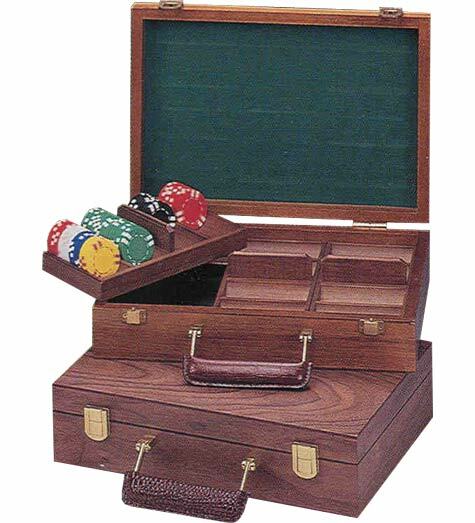 This Wooden Poker Chip Case is made of oak-colored hard wood. 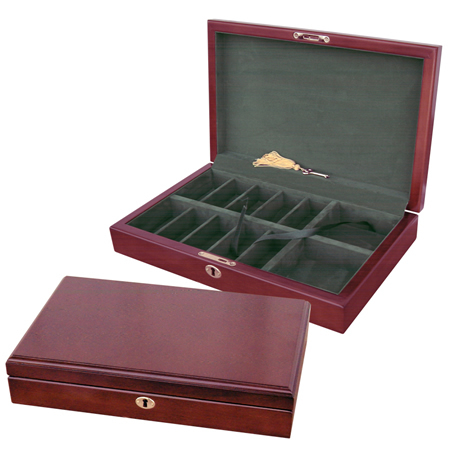 Each case features sturdy brass color clasps / hardware. A soft velour style material lines the inside to protect your chips. Choose from three chip capacities: 200 (8-1/4" x 8-1/4"), 300 (11-3/4 x 8-1/4"), and 500 (15-3/4 x 8"). 300 Case Sale: $25.50. Was $42.50. Save 40%. 400 Case Sale: $34.50. Was $57.50. Save 40%. 500 Case Sale: $37.50. Was $62.50. Save 40%. These Poker Chip Cases feature "Poker Chips" imprinted on the cover. Each case is lined on the inside to protect your chips. The lid is secured during transport by two snaps. You can choose from 200 and 300-chip capacity cases. These Imported Wooden Chip Carousels are handsome and sturdy. 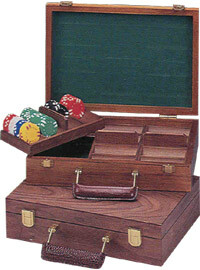 They feature hard wood construction, metal carry handles, and slots for two decks of cards. 200-chip capacity carousels and 300-chip capacity carousels are available with or without 8 Gram Diamond Chips. SALE – SAVE UP TO 45% OFF! 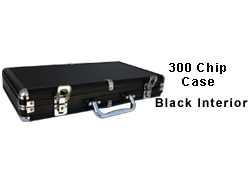 For additional information on these Poker Chip Cases and Poker Chip Case Sets, please call 1-800-233-0828. Feel free to browse our wide selection of Poker Supplies including Poker Accessories, Poker Books, and Poker Tables. For a FREE Catalog or more information, please contact us at 1-800-233-0828.